One of my favorite tenkara creeks runs beneath a foot bridge in an urban park. 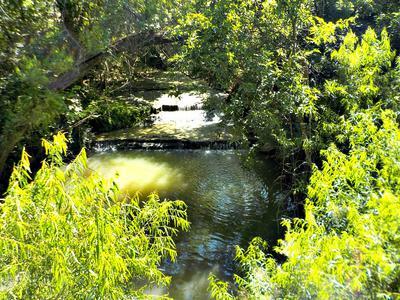 This beautiful spot is within 30 minutes of downtown San Antonio. Sometimes the fishing is excellent . . .
. . . And sometimes you have to deal with extra trash. Lately I’ve been giving “urban tenkara fishing” some thought and was wondering about others’ experiences. While I don’t suppose there’s a universally-accepted definition, I usually think of urban fishing as “city fishing”—wetting a line and fly within thirty minutes of a major population center. As cities become larger, and wilderness shrinks, I think urban fishing will occupy a bigger slice of the outdoor pie. Frankly, my experiences have been mixed. I regularly fish at the Cibolo Nature Center near Boerne, TX, and that spot is a real joy. Yes, there’s quite a bit of foot traffic in the area, but Cibolo Creek always has an abundance of sunfish ready to strike, with a nice mixture of bass, catfish, and cichlids thrown in. 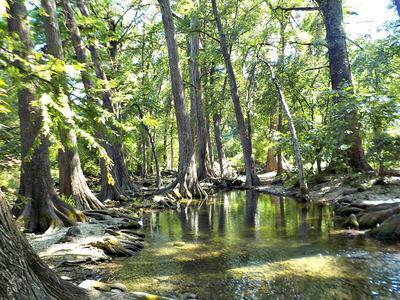 It’s located within a half hour’s drive from San Antonio but still has a nice country flavor with plenty of good wading and walking trails. The area is generally well-kept, and most visitors are respectful. The fishing is often outstanding, and my seiryu rods allow me to work productive waters that conventional anglers bypass. On the other hand, I’ve visited some urban fishing spots in and near the big city that are no longer on my list. Frankly, a couple of spots didn’t feel safe, or all the traffic and trash spoiled the experience. Sometimes the water quality was poor. I have no intention of fishing a spot where I have to glance over my shoulder to see who’s sneaking up on me or watch my feet so that I don’t impale myself on broken glass. The posted regulations may say that fishing is allowed, but I’m not returning because it wasn’t any fun. At other times, however, I’ve had to dodge rocks from teenagers who were chunking stones over a cliff but didn’t see me standing below! I’ve met kids skipping school, honeymooners, photographers, joggers, bird watchers, illegal campers, and lots of folks walking their dogs. Most people are friendly and encouraging, but not everyone. The most common problem I encounter is owners running their dogs off the leash in areas where it’s not allowed. Usually the pets are fine but not always. “He won’t bite,” doesn’t offer much solace when the animal is baring its teeth and growling. You end up taking the good with the bad. I’ve learned to lower my expectations when I first visit an urban tenkara spot. That way, I’m often pleasantly surprised but seldom disappointed. By far, my best times have been when I’ve gone in the middle of the week during “off hours.” Indeed, there have been a few days when I didn’t see a single other person except in the parking area, and the angling was excellent. I treasure those memories. Sometimes you have only a couple of hours to fish, or you just can’t get away to a more secluded spot. Still, you have to scratch that “fishing itch,” and urban fishing offers an outlet. For folks with limited transportation or mobility, urban fishing may be their only option. There are some tradeoffs between solitude and convenience. I always encourage folks to make sure that they have their fishing license and identification with them, plus make certain that you have the clear, legal right and access to fish. Always remain aware of your surroundings. Most of the “horror stories” I hear about occur when people mistakenly think they don’t need a license, or they attempt to fish in areas where angling isn’t allowed. 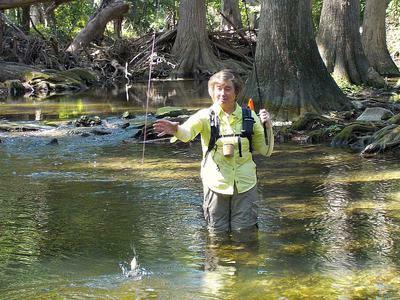 Don’t guess about whether urban streams are private, semi-private, or public access. The last thing you want when you head out the door with your tenkara outfit is to have a confrontation. Also, leave a place cleaner than you found it. What has been your experience, and what tips would you offer? John, What a great article. Fortunately, I live in an area that has invested (money, volunteers, resources, and education) in the urban fishery here in Boise, Idaho and the Treasure Valley. With your half-hour drive in mind we have several choices. The Boise River, the Snake River, the Payette River, and several urban ponds. The Boise River is reasonably stocked and has an excellent brown trout population as well as mountain white fish. Here are some of my thoughts as I think about all of the opportunities. We even have an island in the middle of the Boise River that is a State Park. First off, you can't fish it all. Like you implied in your article, find some favorite spots and learn them well. I have found a couple of places less than 15 minutes from my house on the Boise where I have never ran into more that two other fisherman. I am learning that stretch of the river. Interestingly I have been visiting with a fellow Tenkara fisherman that I met on this site who has had some poor experiences in downtown Boise. I live 25 miles from downtown Boise. Try to find times to fish when the crowds are smaller. I like to fish early mornings for that reason. Besides this time of year, it is too hot in the afternoon. We haven't had our float season due to high water, but I try to avoid the "rubber hatch" when the float tubes, kayaks, and rafts are coming down the river. Fish the off seasons if it is legal. My favorite time to fish the Boise River is in the fall and winter. A couple of times I fished so close to the Boise State Bronco's stadium that I could fish and listen to the game at the same time. If you find a jewel of a spot, keep it to yourself or only those you can trust. I had a gem of a spot that was a little work to get to. I made the mistake of sharing it with someone who I didn't know very well. Two weeks after sharing with him, I went out there and found 9 people fishing that 200 yard stretch. I asked 3 of them how they found the spot and they told me the name of the person I had told. Others may know of your gem, but they aren't telling either. I have another nice riffle-run- pool-riffle that I like, and I run into the same guy often. That said it is just him and me that fish the spot, and we catch and release. We visit, and we don't tell. We've talked about it. Last, don't be afraid to explore. Jump on Google Earth and save yourself some time and explore from your family room before going out on the stream. When I get on the freeway to go to work, I go over Indian Creek. There are trout in that creek both above that stretch and below that stretch. I would guess there are some in there too. Where I get on the freeway it runs between the railroad tracks and the freeway for about six miles. I have currently mapped out 3 good access points. There is a section behind a large mall that has a lot of trees. It looks like once you are in there it will be a fairly nice looking setting despite what is only 40 to 100 yards on either side of the creek. I then called the Fish and Game, and they said as long as I stay in the creek or on public lands I can fish there. This may be taking it to a bit of an extreme, but I bought a chip for my GPS that I use for hunting that not only tells me what is private or public land, but who the owners of the land are. So I may seek better access from one of the land owners. Since I have the tool, I might as well use it. One of these days I am going fish there. Check with your city or towns Park and Recreation Department. You never know what gems may be close by. My son found a stocked pond 3 blocks from his house and he is enjoying some 30-40 minute fishing sessions with his new Suntech GM Suikei Keiryu Special 44. P.S. Don't loan your rods to family members. Solid advice, Les. When in doubt, ask--don't assume! There are one or two urban spots I fish where I almost never see anglers. Part of the reason is that conventional angling methods don't work well in these spots, while fixed-line fly fishing is just right. Always loan rods to family members! Well, as you know, I've already lost the battle of loaning rods . . . I've found the silver lining, however . . . It gives me a good excuse to buy another rod that I've had my eye on. Too many rods not enough money! I did replace the Keiryu 44 Special with a TenkaraBum 40. They are not the same, but I am having a lot of fun with my new rod. In all fairness when I told Chris about my son's new found excitment for fishing due the 44 Special, he informed me that he only had one left. Now the new ones won't be here till September or October. That said, I must give a shout out to Chris for giving us so many choices. I have been on 3 Tenkara websites where they pretty much tell you what rod to buy and have few choices. I continue to play with my Kyogi rods and will be fishing the 12 and 18 tomorrow AM on the Boise River. These are the most versatile rods I own. (My opinion). My first choice is going to be to fish with the "Keeper Kebari." I was wondering why the fish are just slamming this fly right now. Have you ever seen a Mormon Cricket? I hadn't till this year. Talk about matching the hatch! The next rod might just be a special order Kyogi 15. The Kyogi rods will protect a 6x tippet in my own testing. My rating is 6x to 0x. Speaking of hatches, the Idaho Statesman just announced that (the "Rubber Hatch") Boise River float season officially opens Saturday. All this to say, I agree with John, it is always nice to have an excuse for a new rod, and Chris that we need to care for our families! That cracked me up so much I forgot being cheap and bought the more expensive rod he recommended. It's the FMX Keiryu Stiff 45 in my last 2 reports, and I absolutely love it. Thanks, Chris. By the way, my loaner rod is the 12' Iwana I bought back in 2010 and haven't used it since discovering T-Bum. No takers so far. This year while fishing two people recognized that I was fishing "one of those Japanese rods"; one even knew the name Tenkara. A lady in a kayak was very interested and if she has a good memory she'll get on this web site. Since moving to Minneapolis most of my fishing has qualified as "urban" to the point of a high percentage being right in Minneapolis proper. Of course, I'm spoiled that Minneapolis has particularly fantastic fishing for urban area. Typically I'm fishing fixed line carp rods and redworms or cutbait for a huge variety of warm water species - various Sucker/Redhorse/Buffalo species, Bowfin, Catfishes, Basses, Drum, Carp - usually in a not targeted way, which makes half the fun finding out what species turn up on a given day. I think you've hit on something there. For several reasons (water temperatures in urban settings, perhaps lower water quality, less free flow), "rough" fish species such as freshwater buffalo, catfish, carp, and so forth can be the dominant species in "city fishing." For example, in several spots that I frequent, Rio Grande Perch (Texas Cichlids) are plentiful. They're a blast on tenkara/keiryu rods and offer a wonderful challenge. An angler just has to adjust his thinking a little. John you are right about the Urban experience. I fished the Boise River this morning and for the first time ever caught sunfish out of the river. The channels have all changed, and there are several new snags due to the flooding. There is always the possiblity of a catfish or a carp even though I fish the area of the river that transitions from trout to smallmouth bass. Tony - I lived in Minneapolis when I was in Junior High, less than 3 blocks from Minnehaha Creek. It would be a perfect Tenkara Creek if you haven't tried it yet. I fished it often. My brother even caught a Muskie out of it! Lots of great memories! My urban tenkara experience in Kansas City has been hit and miss. There some decent urban lakes in the area that are easily accessible and consistently yield plenty of bluegill, crappie, bass, etc. However, I've had less success fishing urban streams. I've found few stretches of water that contain fish beyond the roughest of species (primarily carp and gar). Poor water quality is the main issue - at least with the streams I've scouted and fished. I rarely run into other anglers at these urban streams. The ones I do encounter are bait fisherman targeting catfish. 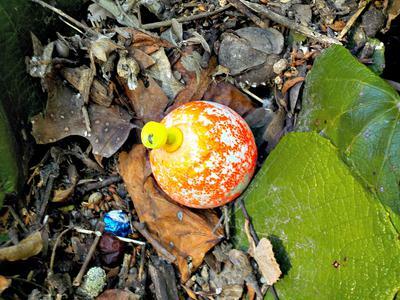 If you get off the trails, you have to be mindful of running into transient camps. In the summer, these streams can also get pretty snakey. What I find most frustrating during my urban tenkara outings is the abundance of trash I come across - especially when it's obviously trash left by other anglers. I'd be interested to hear about the experiences of other Kansas City-area tenkara anglers who fish streams within the city. -Tony- It is nice to see Minnehaha cleaned up. I fished it in the mid 1960's You really had to pick your spots, and we caught a lot of carp! We didn't know they were "trash fish." We just knew they put up a heck of a fight! (I can't be that old!) So what are your "go to" fixed line rods for the Twin Cities Creeks? -Herb- One of my fishing buddies counted his rods, he has 114! I know I don't have near that many. I am hoping to do some more exploring of several ponds in my area next week. One thing this website and type of fishing has rekindled is my curiosity of "I wonder what kind of fish is in there?" The right number of rods. Thank you for that, Les. Now we know the right number of rods. I'm feeling a lot better about my rod collection now! On a more serious note, I do believe that tenkara/keiryu/seiryu rods give you another--and often, better--way of exploring urban waters. Several times I've had conventional anglers ask, "You're catching fish there? Right there, in that little bit of water?" A 1 oz. rod opens up a whole new world of fishing. Also, if things aren't promising in an urban spot, you can just collapse the rod, slip it in your daypack, close a small tin of flies, and be on your way. The equipment is super-light and easy to pack. Ah, Tony you are a fellow Kyogi fan! I am heading out in a few minutes for some "fish and fling." The bow hunter's version of "cast and blast." I need to get some range time in with my bow, antelope season is next month! Our range is right next to the Boise River. There are a few good holes. I'll be taking the Kyogi 12 with me this morning. There can be catfish and carp in the holes I will be casting to. If you like the Kyogi 21, you would love the 12 for the tight spots. It is a 360cm delight! It is becoming a "go to" rod for me. I love the Kyogi rods. They are all such smooth casters. Chris can get you a 12 (360cm) on a special order. I am seriously thinking about the Kyogi 15 on a special order (450cm). When checking out Paul Gaskell and John Pearson Karasu rods on their website, they are starting an exclusive club for their new rods. Maybe a Kyogi club would elevate it's status! These are smooth powerful rods. It would be nice to hear from some of the other Kyogi users. Biggest fish so far on the Kyogi 12 is a 4.8 pound carp and a 17.5 inch smallmouth bass. Biggest fish on the Kyogi 18 is an 11.4 pound carp and a 5.2 pound largemouth bass. The only fish landed on the Kyogi 21 so far is a 4 inch cutthroat trout. I had an 18-20 pound steelhead up to the boat before the guide lost it with the landing net. I'll be fishing the 21 in the Snake River for carp next month now that the water levels are dropping. I am so spoiled by the Suntech Keiryu Sawanobori 63 it is my go to long rod. That said, my son and I are going to Bear Valley on Monday again and he said to me on the phone, "Dad bring the long rod too, I want to fish it some." He isn't getting my Sawanobori! I'm going to take the Kyogi 21 just to see how much fun it can be with 12-18 inch brook trout. Just got back from my "fish and fling." River level was good, irrigators are over watering. The water was so off color it looked like chocolate milk. I didn't even get a bump! One problem with Urban fishing is there are places they don't care much about the water. This never happens at my other spot near the house as it is above the offending farmer! It is going to 101 today. I should have brought red wigglers. I fished the keeper kerabi. Great casting practice! Chris, I hope you get some fishing in! I took 5 days off the end of August for fishing. I wish I could run up to Montana, but I am on the other side of Idaho. Here is a call out to all of you Montana customers, kidnap Chris for a day of fishing! Oh, Les, if I get any fishing time it will be work, not play. I need photos for an article to be written for Suntech about tenkara fishing in the US. I also need photos for a page I need to write about the Tenryu Rayz Integral RZI50UL-4, which is a sweet little 5 foot 4-piece ultralight spinning rod that breaks down to fit in a daypack or a Medium Rod Case. I can definitely take both the spinning rod and the TenkaraBum 40 out at the same time. Very convenient. I don't just need a Montana tenkara angler, I need a Montana tenkara angler/photographer! I don't know what your publishing arrangements are with Suntech, but I hope we will be able to read the English translation of the piece sometime in the future. Happy traveling, fishing, photographing, and writing! Hi everyone - I've got a 17 ft Kyogi that I primarily use for sight fishing for carp. I am looking to expand my Kyogi horizons. does anyone have an idea of what type of rig it was originally designed to throw (e.g., keiryu style)? I usually use about 12-15 ft of clear level line with keiryu markers, about 1-2 ft of tippet(0-3x), and a weighted fly (e.g., backstabber, carp assassin, etc. ), or shot with an unweighted fly. What other lengths and types of rigs/flies are people using out there, particularly for non-carp (e.g., floating line, lighter flies, streamers, etc.)? In my experience, it doesn't seem to throw light or unweighted flies that precisely with just level line and tippet. Those are all good questions, and I'll leave it to the Kyogi owners to describe their set-up for that particular rod. For what it's worth, my wife and I do fish a lot for "non-carp" urban species, such as catfish, freshwater buffalo, and cichlids. We normally use the highest-quality, ultra-light furled leaders we can find, with 2-3' of 5X tippet on the sturdy Suntech Field Master and similar rods. We just like the way the furled leaders feel and cast. Having said that, I think most experienced tenkara/keiryu anglers end up preferring level lines. As for flies, my wife has great success with any type of "shaggy" Czech nymph, which she just bounces along the bottom. A lot of folks think that catfish won't strike artificial flies, but that's just not true. I'll be interested to read of the set-up others prefer. Chris calls me the "Kyogimeister". I have a Kyogi 12,18, and 21. My favorite all purpose line is a Copolymer line. It is "Bagley's Silver Thread AN 40." It is 12 pound test. It works well with all three length rods. It is much more supple than fluorocarbon. This allows for easier tight loops with the fast action in the Kyogi rods. This is my general purpose line. Specifically with the Kyogi 18, I have fished this line with Kieryu markers. For fly fishing, I try to keep as much of the line off the water as possible. I have found that a small float(strike indicator) where I go from this line to a tapered leader helps with casting. A good tapered leader is a must if you are wanting to do some dry fly fishing with the Kyogi. I have fished down to size 18 dry flies with mine. The second line I really like is the Nissin PALS SP Pro 4.5 meter line (sold by Chris) again fished with a tapered leader. I have fished both of these lines with 6x tippet and no lost fish because the rod could protect the tippet. I have had 75% success with 7x tippet. I have caught trout, sunfish, smallmouth and largemouth bass with this setup. The Kyogi does well with this set-up. My general line for fishing red wigglers and large wet flies is the Silver Thread with a snap swivel, and then 4x tippet material. For Carp, I prefer to fish with 1x tippet. I use various baits. However, that would be a whole different discussion. If you want to get a nice turnover on a fly, a good tapered leader really helps. Like John, I preferred the furled leaders. I hope this helps. I have a lot more experimenting to do. I hope this helps.